Last night’s CNN Iowa Democratic Candidates Town Hall (9-11pm) was the most watched primary candidates’ cable news event (excluding debates) on record. 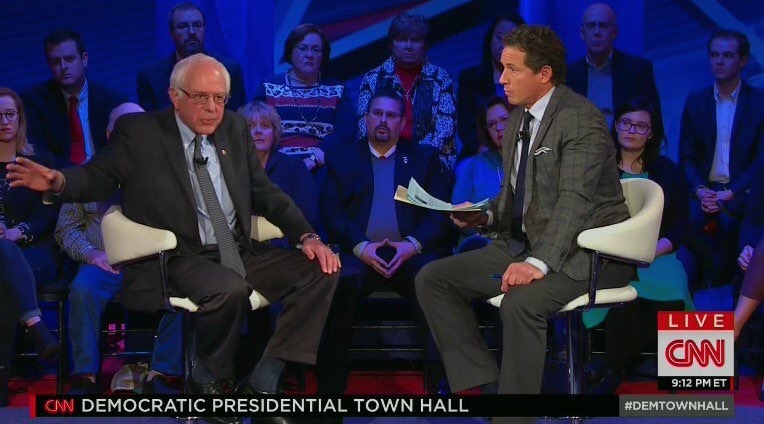 Hosted by Chris Cuomo, the Iowa Town Hall was #1 in cable news last night among total viewers, 25-54 and 18-34. The CNN Town Hall averaged 3.201 million total viewers, Fox News followed with 2.134 million and MSNBC trailed with 850k. Among 25-54, CNN was top rated (944k) and outperformed the combined delivery of Fox News (407k) and MSNBC (205k). Among the younger demo 18-34, CNN ranked #1 with 404k, Fox News lagged far behind with 51k and MSNBC had 40k. CNN posted a triple digit advantage (+127%) and more than doubled MSNBC’s recent First in the South Democratic Presidential Forum (11/6/15) in the demo (944k vs. MSNBC 416k) and did +38% better in total viewers (3.201m vs. MSNBC’s 2.325m). The post-program, CNN Tonight with Don Lemon (11p-1a) also ranked #1 among total viewers and the demo 25-54 last night. In total viewers, CNN had 1.275 million, Fox News registered 1.136 million and MSNBC posted 407k. In the demo, CNN averaged 423k, Fox News followed with 314k and MSNBC had 117k.